Tennessee DUI Laws | Raybin & Weissman, P.C. When you’ve been arrested on suspicion of driving under the influence, you could be facing serious penalties if you are found guilty. Fortunately, you can obtain an experienced TN DUI lawyer to help you defend yourself and avoid a conviction that could completely upend your life. Below, we go into greater detail about the state’s implied consent laws and the consequences associated with a DUI conviction. Every driver across Tennessee operates their vehicle with implied consent. What this means is that if law enforcement has reasonable belief that you may be under the influence of drugs or alcohol while driving, they have the authority to pull you over and request that you submit to blood alcohol concentration (BAC) testing that will determine whether you are, in fact, under the influence. If you refuse to submit to the testing, even if you were not drunk driving, your license will automatically be revoked for a period of one year. Repeatedly refusing to submit to BAC testing can extend your license revocation to a total of two years or up to five years if your drunkenness caused the death of another. First-time DUI convictions can result in penalties which include nearly a year in jail, license revocation, fines of up to $1,500, be ordered to complete a drug or alcohol treatment program and be required to install an ignition interlock device for up to one year. Individuals who are habitual DUI offenders could be facing fines not to exceed $15,000, the seizure of your vehicle, a license revocation which could last up to eight years, 365 days in jail, and other consequences. With stakes this high, working with a lawyer will be your best chance to clear your name of all charges. 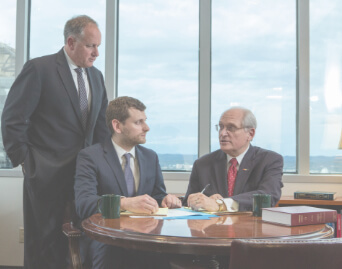 If you are interested in learning more about how your Tennessee DUI lawyer at Raybin & Weissman, P.C. will defend your case, schedule your free, no-obligation consultation as soon as possible. You can contact us by phone at 615-256-6666 or through the submission form below.